Despite some reservations, the arts and science can combine and when they do it can create something beautiful, writes Lisa Jardine. Outside the president's office at the Royal Society, in Carlton House Terrace, hangs a charcoal-and-chalk study by Henry Moore of a gnarled pair of hands. It is a life drawing of the hands (in old age) of crystallographer Dorothy Hodgkin, Nobel prizewinner for chemistry, and one of the earliest woman fellows of the Royal Society. A watercolour sketch of her by Graham Sutherland hangs not far away, but I prefer the study of her hands. For me, Moore's rendering of Hodgkin's strong fingers brilliantly conveys the rigour and creativity which together characterise her ground-breaking scientific work. Dorothy Mary Hodgkin was born in 1910 and died in 1994. In a long and successful career, she was responsible for crucial developments in the techniques of X-ray crystallography, a method used to determine the three dimensional structures of complex organic molecules. A narrow beam of X-rays is passed through a crystal. The diffracted X-rays are then meticulously photographed from all angles, and from the resulting patterns the arrangement of atoms can be calculated and plotted. It is a technique which in 1953 proved vital for the unravelling by Crick and Watson of the structure of DNA. 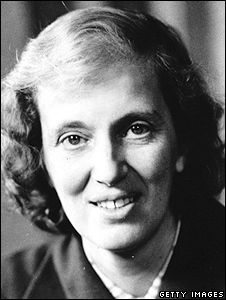 During the Second World War Dorothy Hodgkin used X-ray crystallography to confirm the structure of penicillin, and then to establish the structure of vitamin B12, for which work she was awarded the Nobel Prize in Chemistry. Five years later, in 1969, after almost 35 years' painstaking analysis, she deciphered the fundamental structure of insulin. Besides her outstanding research achievements, Dorothy Hodgkin was passionate about scientific responsibility - particularly the need for scientists to acknowledge potentially dangerous or ethically problematic consequences of their discoveries. From 1976 to 1988 she chaired the Pugwash conferences - a group established in the 1950s by Einstein and others concerned at the dangers to world peace posed by the development of the Hydrogen bomb. Her distinguished record continues to be recognised today by the Royal Society's eponymous fellowships for early career achievement in science. And when the Royal Mail issued 10 stamps of great scientists and their discoveries last week, as part of the celebrations for the 350th anniversary of the Royal Society, the only woman among the 10 was Dorothy Hodgkin. Both within and beyond her discipline, Hodgkin communicates a sense of wonder at the sheer beauty of nature's design. Fittingly, she rose to scientific eminence in the late 1940s and early 1950s, the period which gave rise to that great celebration of a progressive and peaceful post-war Britain - the Festival of Britain. The 1951 festival was an initiative of the post-war Labour government. It commemorated the Great Exhibition of 1851, and at the same time showcased Britain as a world leader in science and the arts, with special emphasis on the applied sciences, technology, industry and design. The idea that artistic and scientific creativity are interrelated underpinned the entire endeavour: "[Scientific] knowledge," one of the leading organisers wrote. "Is of incalculable value, for in a unique way it goes on widening the horizons of human thought, offering it whole new territories of beauty and order to explore." The London-based centrepieces of the festival were the South Bank Exhibition and the Festival Pleasure Gardens in Battersea, but the festival was celebrated all over Britain in the summer of 1951. Although it was open for only five months, the South Bank Exhibition attracted more than eight million visitors. After the devastation of war and years of austerity it was consciously intended to raise the spirits - in the words of Sir Gerald Barry, director general of the festival, to provide a "tonic to the nation". "One of the principal aims of the festival," the organisers wrote in the South Bank Exhibition's catalogue. "Is to bring to the British way of life some enrichment that will endure for long after the festival year is over." I was taken to the South Bank Exhibition myself at the age of seven, and have lasting memories of its atmosphere of expectation and promise - though I regret to say that my strongest recollection is of the shiny piece of machinery producing endless sticks of rock with the lettering "Festival of Britain" running through it. With characteristic commitment, Dorothy Hodgkin played a prominent part in one of the festival's groundbreaking initiatives combining cutting-edge science and confidently modern design. The Festival Pattern Group brought together a team of modern-minded crystallographers and adventurous commercial manufacturers. The activities of its eminent scientific and industrial participants were coordinated by Mark Hartland Thomas, chief industrial officer at the Council of Industrial Design - a government agency established in 1944 which later became the Design Council. Among other distinguished scientists involved in the project were Sir Lawrence Bragg, John Kendrew and Max Perutz. Leading Cambridge crystallographer Dr Helen Megaw collated diagrams of crystalline atomic structure contributed by her eminent colleagues and ensured that they were interpreted in an accurate and authentic way. 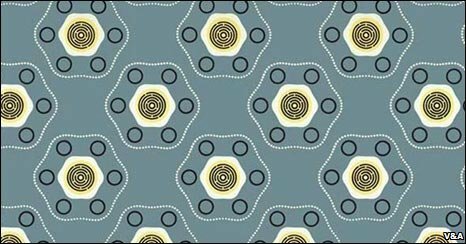 A diagram by Sir Lawrence Bragg of the hexagonal crystals of beryl became a delicate machine-embroidered lace, Max Perutz's diagram of haemoglobin inspired a nitrocellulose-coated wall covering by ICI, and one of Dorothy Hodgkin's images of insulin formed the basis for a particularly successful wallpaper design. These and other strikingly modern designs were prominently displayed throughout the festival buildings, notably in the Regatta Restaurant on the South Bank (whose interior was decorated with crystal structure-patterned furnishings), and in the fabrics and fittings for the Exhibition of Science at South Kensington. What a pity, then, that 60 years on, we have apparently lost confidence again in that strong connection between science and the arts the Festival of Britain celebrated. Last weekend, in a letter to the Observer, a group of leading academics and cultural figures voiced their fears for the future of the arts and humanities in British universities. Deep funding cuts, and a decision to concentrate what funding remains on the sciences had, they maintained, left the humanities vulnerable and exposed. "These are worrying times for the arts and humanities," these leading figures in education and culture wrote. "There seems to be a belief in government, and in much of business, that knowledge can be cut into discrete blocks and that the ones that matter most are those of science and technology, engineering and maths." Many of us will find such an adversarial voicing in the academy of a settled opposition between science and the humanities all too familiar. It is a continuation of the long-running debate initiated by CP Snow in his 1959 Rede lecture entitled "The Two Cultures and the Scientific Revolution". That lecture ignited an often bad-tempered debate about the relative importance for British society of the arts and sciences, and permanently enshrined the phrase 'the two cultures' in our popular vocabulary. Yet the pioneering design activities of Dorothy Hodgkin and her crystallography colleagues for the Festival of Britain, which gracefully and unselfconsciously brought together science and the arts, surely provide us with a stronger and more optimistic example of a possible way forward? For them, design offered a unifying context, within which a productive dialogue could be set up between those with expertise in (in this case) crystallography, and those with a training in the visual arts. In February of this year, Sir James Dyson, the inventor and entrepreneur, pledged a generous £5m to the Royal College of Art, in the hope that a new generation will rediscover the nation's talent for "making things", in the optimistic tradition of the Festival of Britain. Announcing the donation, Dyson made an impassioned plea for a renewed commitment to design and engineering to rescue Britain's ailing manufacturing industry. "If we are able to go on training very good designers and engineers," he said. "And manufacturing is given the right sort of support by government, I believe we can turn the tide and start exporting more than we import - and have great fun in the process. That's what we used to be so good at." In straightened times, it is not inevitable that arts and sciences should retreat into their separate siloes. I would like to think that, with the future of our universities at stake, we could draw on shining examples like Dorothy Hodgkin and James Dyson - both committed in their distinctive ways to a design-led culture that brings together arts and sciences, and to breaking down the boundaries between the "two cultures". United we stand, building towards future prosperity and continuing intellectual distinction for Britain. Divided, we surely, inevitably, fall. One of the flaws of the tendency of education to focus too early on arts OR sciences, or worse to become grimly vocational! Personally I enjoy the beauty of a Mandelbrot set, and the Fibonacci series - and I am neither mathematician nor artist, but a botanist & computer scientist. Why is it so easy to get an arts degree and so hard to get a science one? I believe a degree should incorporate both. Who was it said "art plus engineering equals genius"? Watching Concorde in the air was poetry in motion. Concorde was a superb work of art. I think praise is also deserved for those writers who can bring science ideas to a wider audience, particularly where those ideas (string theory, quantum physics) can seem incredibly esoteric - or conjure up bad experiences in school. The best science writing never dumbs down, it just works the language hard (with metaphor and stories) to explain the most complex of ideas. I would say writers such as John Gribbin, Ben Goldacre and Ian Stewart should be applauded for bridging "the two cultures". Art is open to criticism e.g. as a "self-indulgence" and faith is open to criticism as "irrational". Science separates itself from arts, humanities, religion and wider culture - in short, from non-science - in order to evade having to answer the same challenges about self-indulgence, irrelevance, value-for-money, irrationalism, vested interest, and so on. Science should be challenged in the same way but it has protected itself from this by assuming a position for itself above criticism. Everyone knows that the science used to justify technology and the industries built on them is indefensible philosophically - the theories are tentative and have poor epistemological value but they are used to justify non-tentative claims made about products and services sold by the industries that fund the science in order to have this ideological prop. Open science to the same level of criticism routinely experienced by arts, design, literature, music, faiths, architecture, cookery, sports, politics, etc. and you attack the market value of those goods and services. I always thought that sciences or engineering, have a profoundly artistic side, despite it not being evident. It is true that in engineering form follows function, but the final product, simplified to the greatest extent in order to reduce costs and failures, is a piece by itself. Of course, this is difficult to see for the untrained eye, partly because aesthetics are not the focus, and partly because the topic in itself is too subtle to receive media attention. The social "sciences" must make more of an effort to be useful and valuable to society. If the total contribution of natural sciences over the past century had been to hang around failing universities and offer "critiques" of the society which supports them, people would think seriously about whether money spent on them was worthwhile as well. Instead, through advances in engineering and medicine, our lives are immeasurably better off. The social sciences have to learn to separate their social and political opinions from the work they undertake and produce actual results which improve the lives of all people, rich and poor. Of course science can be art! I have seen images of magnified cells and diseases and when they are coloured, they look magnificent, very eye-catching. It's odd to think that something so awful as a flu virus cell can look so pretty. Same with astronomy, when we get to see magnified images of the start and planets and everything that goes on 'up there' they always leave me lost for words with their beauty. The division that has grown up between science and the arts is unfortunate. As a former curator of Paisley Museum in Scotland, I am only too well aware of the role of science in the manufacture of the beautiful Paisley Shawls and cotton sewing thread. Design is an excellent focus for bringing these two areas back together. How much more understandable Science becomes when it appears on Wallpaper or a cushion cover. Above all how optimistic. Surely no-one needs better proof of how technology and design can work together to great commercial success, than that provided by Apple and its British Head of Design Jonathan Ive. I would draw a different conclusion, namely the use of crystallographic patterns and electron density maps did not influence the graphic arts significantly, or for long, and had no impact on, or connection with, the world of colour, shape and meaning represented by eg Stanley Spencer, John Piper, Henry Moore, Freud, Bacon, Graham Sutherland, Nash, Ravillious....who were active at that time. In fact the crystallographic bit of the Festival of Britain, which I visited, felt contrived. I speak as a grateful and partially enlightened spectator of the "arts", and as an ex-crystallographer in the Cavendish Laboratory in the early 50's. I haven't come across anyone who can speak with authority on science and humanities without being contrived in one or the other [or both!]. The two cultures are still separate. Sounds blunt but space is limited. Everything is connected to everything else at one level. At another level, it's human interpretation that divides topics into boxes, but for all the universe knows, it stays the same, whether we understand it as an art or as a science, or indeed, anything else entirely. Wondering whether the picture at the top of the article wasn't an unfortunate choice to show art and science successfully merging? Reminds me of those trippy, eyesore 60s-70s wallpapers.